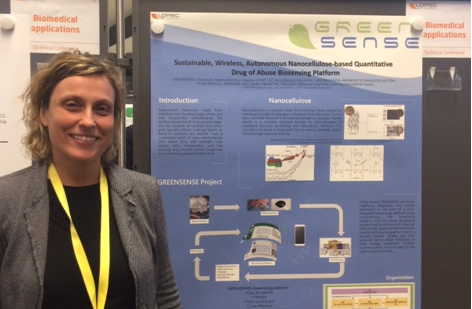 Sandra Martínez, from Leitat, was the GREENSENSE representative at the LOPEC fair. The event took place the 20-21 March 2019 in Munich and it was completely successful. LOPEC (Large-area, Organic & Printed Electronics Convention) is the leading trade fair and the most important conference for the printed electronics industry. It encompasses every facet of this emerging technology, covering the entire value chain—from research and development to specific applications—as well as facilitates those essential business contacts. Sandra explained that lots of people asked her about the GREENSENSE’s poster she showed. Thank you all for being there and we hope to see you soon!